Much of the pomp and grandeur that was the Pearl of the Orient was carpet-bombed to bloody rubble during the Second World War. 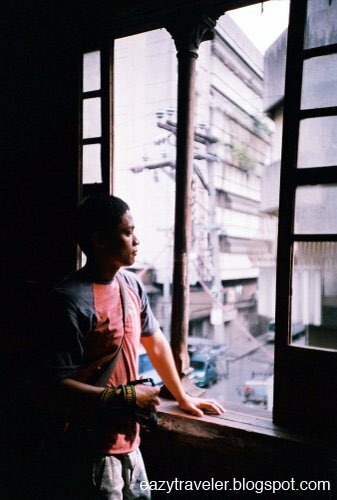 But whatever pitiful remains escaped the terror of Manila’s dark chapter suffers a sadder fate: the slow death of indifference and neglect. Such is the case of a magnificent house in San Nicolas. At the unpopular end of the once-affluent Chinese district, north of the Basilica de San Lorenzo Ruiz (Binondo Church), one can pick up the pieces of Old Manila at the Casa Vizantina, a three-storey bahay na bato (Spanish-Filipino house of stone) at the corner of Madrid and Peñarubia Streets. I first learned about this beautiful neo-Byzantine domicile, with its slim colonnettes, balusters, floral arches and narra floorboards, from Carlos Celdran who regularly visited this historical landmark during his walking tours of Binondo, and recently wrote about its looming misfortune on his blog. A survivor of war, earthquakes and super-typhoons, the house of hardwood was the Tribunal de Sangleyes (Chinese court of justice) built in 1890 by Don Lorenzo del Rosario, a local principalia (ruling class) and building contractor. From 1914 to 1919, the building was leased out to Instituto de Manila, which eventually moved to Sampaloc to become the University of Manila. Today, it hauntingly lumbers decrepit with the weight of time, despair and necessitous tenants. And, after having been proclaimed structurally unsound, sadly faces an imminent demolition reportedly slated at the end of April 2008. 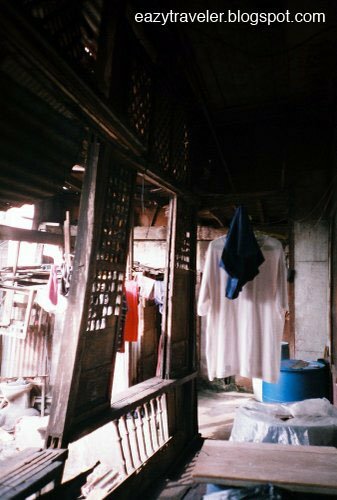 Two hospitable tenants, who pay P1000 per month to rent space, were kind enough to show us the interiors of the house, which was in a sorry, haphazard state. 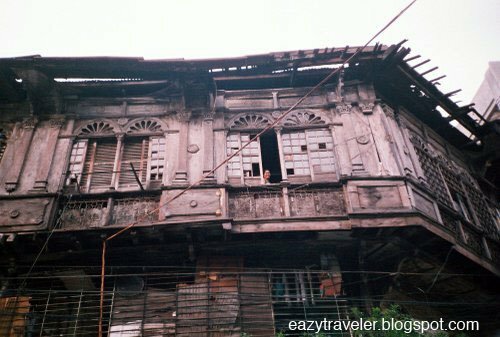 Its capiz windows and some reliefs have long been removed and sold piece by piece to the antique black market. And it seems the entire structure will give way sooner or later. Its residents reckon that the destruction of their home is tentative. I do not know if this elegant abode still stands as of the time of writing, or if somehow by a stroke of compassion it will survive another century of triumphs and tribulations. We found our way to Casa Vizantina via a long walk from Carriedo LRT station (P15), passing through Plaza Lacson, Sta. Cruz Church, Ongpin Street, Binondo Church, Plaza de San Lorenzo Ruiz, and after crossing a bridge down San Fernando St. (where one can find an inconspicuous marker indicating the home of Jose Rizal’s relations). Turn right at Madrid St., until you hit the corner of Peñarubia St. If you ask courteously, residents may show you the interiors of the building. 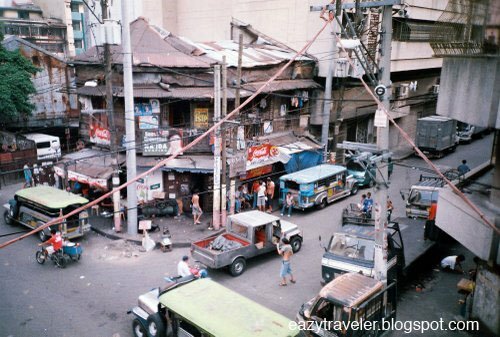 At this intersection (see last photo above, view from Casa Vizantina), one can ride a jeepney (P7.50) to the Pasig River Ferry station at Escolta St. Historical details of the house are from a letter from Eliza Agabin to Carlos Celdran. Old photographs of this house are posted at Carlos’ blog as well. nice info on this. i didn’t saw this place yet. i hope buildings like these will be renovated but making sure the framework and the design is kept. The Fascade is not in a good condition and very dangerous to the people who live in that house. A small earthquake will definetly ruin the house. I wish the owners took good care of it but I guess they never did. Our government, sadly, does not see the preservation as a priority. It breaks my heart to see this house go down. Casa Vizantina lives! In Bagac, Bataan. How much is original, how much, repurposed and how much, newly fabricated is beyond me. Kya Wla na yan bahay nayan giba na,,,Yun isang bahay sa kaliwa giba narin bodega na hgayon….